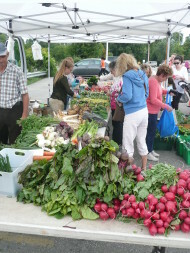 The Woodbridge Village Farmers’ Market is a friendly, big hearted market located on the northwest corner of Hwy #7 and Islington Ave., at the Woodbridge Pool & Memorial Arena parking lot. The market runs every Saturday, rain or shine, between 9am and 1pm from June 17 until Thanksgiving, October 7, 2017. There is plenty of free parking at our market. Our local farmer vendors are passionate about their produce. Our volunteers are always there to help with the many special events. It’s a fun place for friends to meet and families to come Saturday mornings. Our Kid’s Club includes creative crafts and engaging activities weekly. This will be our 9th year of operation. One of the main reasons we exist is to encourage our community to buy locally grown and harvested IN SEASON conventional and organic vegetables and fruit. Also at the market you will find cheese, eggs, honey, nuts and dried fruit, yummy breads and baked goods,curds, dips and jams and prepared food for sale.